When Twitter’s popularity exploded, Facebook took note. Heck, they tried and failed to buy them out. While they managed to subtly integrate some of the same features that make Twitter so unique, they also blatantly borrowed some of the most well known. We’ve got a list of changes that may or may not have seeped from Twitter to Facebook. Starting with the most obvious, the Facebook Live Feed does essentially the same thing as your Twitter Feed. The Facebook Live Feed will automatically push out updates for any of your friends in real time. Before the Live Feed was introduced users relied on the News Feed, which shows only the most interesting content that your friends post. 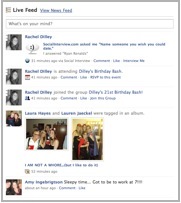 Unlike the News Feed, the Live Feed will show you all the actions that your friends are making. Back in June, Facebook introduced the option for users to select a vanity name that would follow the Facebook URL in an attempt for users to more easily find one another. Although this idea didn’t begin at Twitter, Facebook felt no pressure to offer this same feature that was available at its biggest competitor, MySpace. As Twitter became more popular, outshining Facebook in the real-time communication sector. The introduction of this feature was hugely popular, with over 200,000 members reserving their username in the first three minutes it became available. In September, Facebook added the ability for users to tag their friends in wall posts in exactly the same way that was introduced through Twitter. Users type the ‘@’ and username and the tagged users will receive a notification, much like a mention, that they have been tagged in a user’s wall. Two caveats; users can only tag each other if they are friends and any user has the option to the delete a tag. Pages have mainly been used for businesses, celebrities, and groups. User interaction was minimal, limited to threaded discussions. Earlier in the year, Facebook morphed the look of these Pages into the same layout and allowed the same user interaction as a normal profile. As with Twitter, all accounts now look consistent and allow the same user experience no matter the page. Have you noticed any more changes that seem to have started with Twitter? 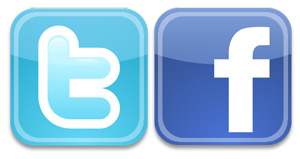 Do you think Twitter will be trying out any of Facebook’s features to make it an even stronger social network? Let us know what you think!